Saint Basil's Cathedral or Pokrovsky Cathedral are official names for a Russian Orthodox Church in Red Square in Moscow. It was built in the 16th century on orders from Ivan the Terrible and commemorates the capture of Kazan and Astrakhan from Mongol forces. It consists of nine chapels built on a single foundation. The riot of color and shapes makes St.Basil's Cathedral unmatched to any other one in the world. The French diplomat Marquis de Custine commented that it combined "the scales of a golden fish, the enamelled skin of a serpent, the changeful hues of the lizard, the glossy rose and azure of the pigeon's neck".The photo was taken last summer during my visit to Moscow. I'm so pleased to read your lovely comment! Your country is also a great tourist destination. Hope to visit it some day, too! It's great that you're interested in Russia and its history. Hope you'll have a chance some day to visit it! Dinu. D and Mike, thanks for the pleasant comments! Thank you for the information, Russia have always attracted me as well as its history. I'll visit it some day. I’m glad that you like this unique cathedral. It’s situated in the center of Moscow in Red Square, so it’s one of the most famous churches not only in Moscow but in the whole Russia. As for Ivan the Terrible he was one of the most well-known tzars in the history of Russia. Ivan IV Vasilyevich known in English as Ivan the Terrible was the first ruler of Russia to assume the title of tsar. He ruled from 1547 until his death in 1584. Ivan the Terrible's name has been much misunderstood by Westerners. In Russian, he was called Ivan Grozny, which has usually been translated as "Ivan the Terrible." Grozny actually means something closer to "fearsome" or "awe-inspiring." A more accurate translation would be something like "Ivan the Formidable." Ivan’s personality was complex. He was described as intelligent and devout, yet given to rages and prone to episodic outbreaks of mental illness. On one such outburst he beat and unintentionally killed his son and heir Ivan Ivanovich. 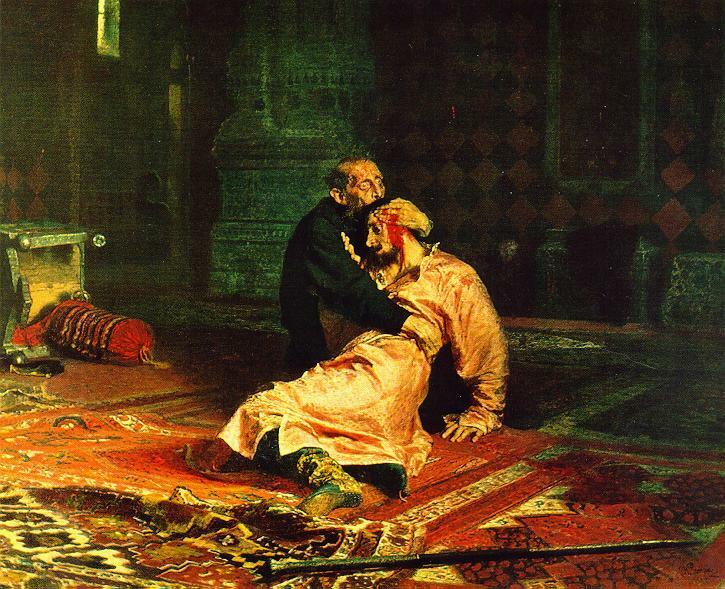 The famous picture of Ilya Repin describes this sad event. Ivan's legacy is complex: he was an able diplomat, a patron of arts and trade, founder of the Russia's first Print Yard, but he is also remembered for his apparent paranoia and arguably harsh treatment of the nobility. Faraz thanks for inspiring me to learn some new information about Ivan the Terrible. My special 'thank you' to you for the word 'princess'! I think it's really great to feel a princess from time to time. Thanks a lot for the nice comment! Have a magic day! It's really great that you like this unique cathedral. It's one of the symols of Moscow and even Russia. I'm so grateful to you for your support!